We were recently invited to participate in a competition for the inaugural summer pavilion at the Sherman Contemporary Art Foundation (SCAF) in Paddington, Sydney. Organised by BVN (moments before they became BVN Donovan Hill… but that’s another story) the brief called for a ‘Fugitive Structure’ in the form of a 20sqm pavilion in the gallery’s ‘zen garden’ that could be used for events, talks, films and so on. It is SCAF’s tilt at the world of the Serpentine/PS1 annual pavilion scene, and hopefully it will become the kind of program that drives a bit of local competition and innovation like its forebears have. The brief was heavily constrained by planning guidelines, presumably in order for the pavilion to not to have to go through a planning approval process, with setbacks from boundaries, heights and footprint limited. 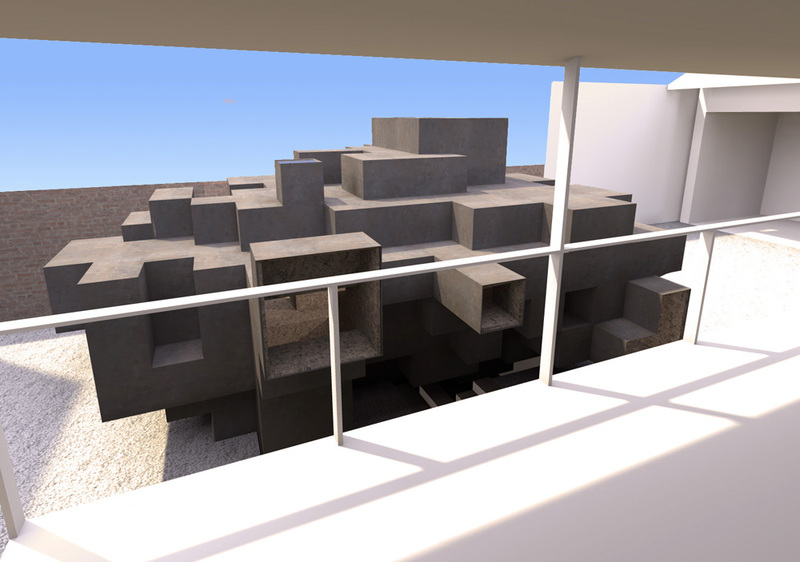 Our proposal was for a pixelated rock in SCAF’s zen garden, a plate steel block with a cork interior which like an artefact from Minecraft, a low res glitchey object, that engages with the graden, raised deck, hedge and sky. More images are up on the BAT website here. There were ten architects invited, three shortlisted and the competition was won by Andrew Burns. Of the ten entries, I know that besides Andrew and ourselves, Scale Archtitects, Tribe Studio, Edwards Moore and Searle Waldron submitted entries. Andrew Burns and Searle x Waldron were two of the shortlisted three. Of these, Andrew Burns, Edwards Moore and Searle x Waldron have put their entries up online.